Simplicity is always a virtue. There is no virtue in poverty. Men must sweat to attain virtue. Obtuseness is sometimes a virtue. Purpose without virtue is vanity. Unadaptability is often a virtue. 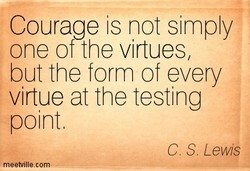 Courage is the virtue of the free. Pride is both a virtue and a vice. Pleasure's couch is virtue's grave. There is explosive power in virtue. There is a virtue in shamelessness. From virtue all happy states arise. Love's like virtue, its own reward. For virtue only finds eternal Fame. Consistency is a virtue for trains. Death, like virtue, has its degrees. 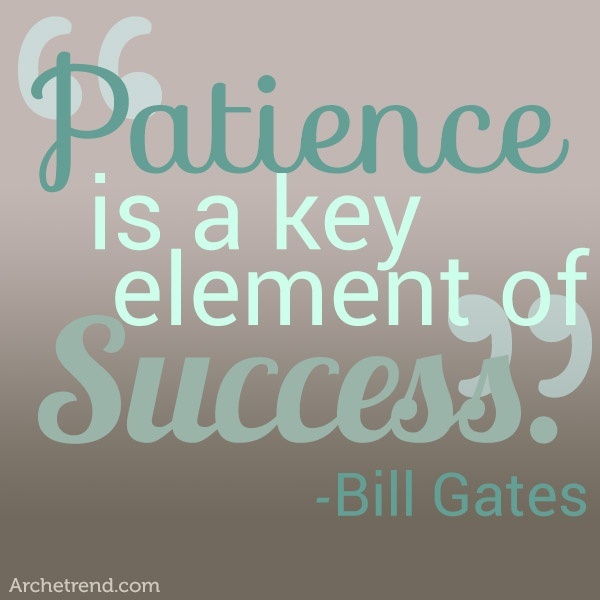 Repetition is a revolutionary virtue. Is not virtue a negation of becoming? Who sows virtue ought to reap honour. I do think vulnerability is a virtue. 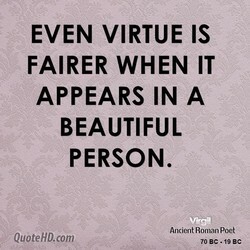 Even virtue is fairer in a fair body. Laziness is a programmers main virtue. Drink wine, drink poetry, drink virtue. I see no virtue where I smell no sweat. Leaders lead by virtue of who they are. Forgiveness is the virtue of the brave. 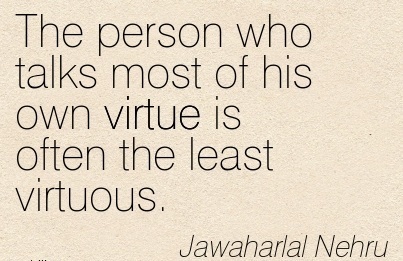 Nobody likes to be accused of a virtue. Discordance is evil. Harmony is virtue. Is virtue something that can be taught? He who dies for virtue does not perish. 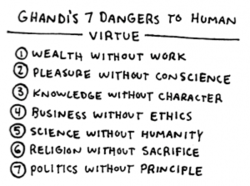 The order of things consents to virtue. Too much virtue has a corrupting effect. Heaven made virtue; man, the appearance. Love is the greatest virtue of the heart. Kindness is no virtue, but a common duty. Goodie-goodies are the thieves of virtue. The virtue in most request is conformity. Charity is a very labour-intensive virtue. Love is an involuntary reaction to virtue. The great theatre for virtue is conscience. There is no sanctuary of virtue like a home. In the winter, warmth stands for all virtue. Let good people sin. Give virtue to rotters. That which is inherent in man is his virtue. All forced virtue is degrading in it effect. Contempt for failure is our cardinal virtue. Happiness is prosperity combined with virtue. Humility is a virtue; timidity is an illness. There is no inherent virtue to instantaneity. Nationalism, like virtue, has its own reward. The whole of virtue consists in its practice. Birth means nothing where there is no virtue. The highest virtue is always against the law. If virtue precede us every step will be safe. Kindness isn't just a virtue, its a necessity. Pity is extolled as the virtue of prostitutes. There is no virtue if there is no immortality. The whole glory of virtue resides in activity. Good manners can render even virtue tolerable. The soul is perfected by knowledge and virtue. As if a woman ever loved a man for his virtue. The only amarantine flower on earth Is virtue. The virtue of a piece is the writer's thoughts. 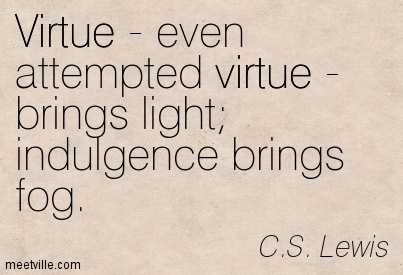 Your virtue raises your glory above your crime. It is useless to talk virtue to a starving girl. 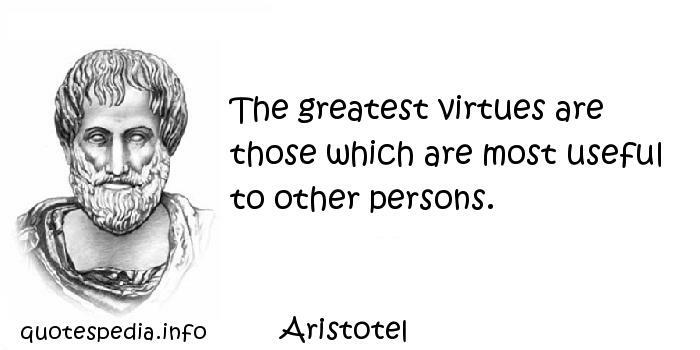 Your favorite virtue? An appreciation for irony. Kindness is no common virtue. It is a rare gift. Those who stand in the way of virtue shall fail! What's virtue in a man can't be virtue in a cat. The poor attend to their own virtue in solitude. Unless virtue guide us our choice must be wrong. 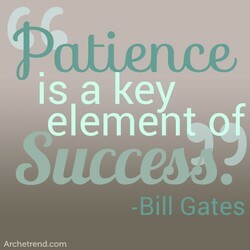 Patience may be a virtue, but quitting is an art. Black is not a vice. Nor is segregation a virtue. The greatest virtue is to follow the Way utterly. Uniqueness isn't a virtue. It's a responsibility. Truth can prevail only in virtue of truth itself. Moderation in the defense of liberty is no virtue. Tolerance is an important virtue of bodhisattvas . 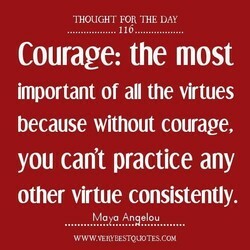 Courage, my boy! that is the complexion of virtue. The ancients called beauty the flowering of virtue. Humility is the beginning virtue of all exaltation. Delicate humor is the crowning virtue of the saints. It costs more to maintain ten vices than one virtue. Great minds always tend to see virtue in misfortune. 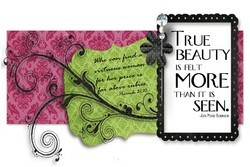 Modesty is a virtue that can never thrive in public. Peace is the soft and holy shadow that virtue casts. Vice deceives us when dressed in the garb of virtue. 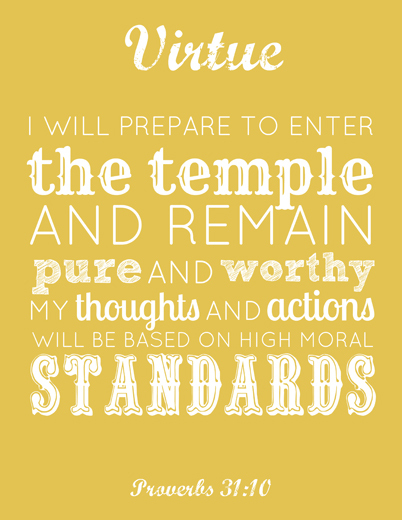 I am only strong enough for a life of partial virtue. The muses crown virtue when fortune refuses to do it. Religions don't own compassion; it is a human virtue. 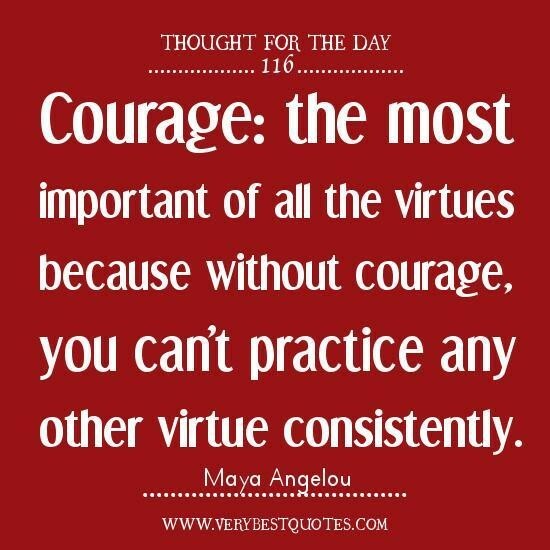 Courage is virtue which champions the cause of right. 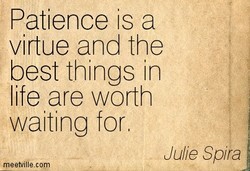 Want of prudence is too frequently the want of virtue. Laziness in doing stupid things can be a great virtue. No single virtue is, on its own, necessarily virtuous. Bravery is a requisite virtue because life demands it. Vice can deceive under the guise and shadow of virtue. When much virtue is achieved, nothing is not overcome. Homeliness is the best guard of a young girl's virtue. The good refrain from sin from the pure love of virtue. I have long served virtue, And never ta'en wages of her. So much greater is our thirst for glory than for virtue. Cultivate virtue in the world, and it will be universal. To the eye of enmity virtue appears the ugliest blemish. When was public virtue to be found when private was not? I think the virtue I prize above all others is curiosity. There is no virtue inherent in un-constructive suffering. The only virtue I want to claim is truth and nonviolence. The safeguards of virtue are hateful to the evil disposed. With wine, poetry, or virtue as you choose. But get drunk. Seldom indeed does human virtue rise From trunk to branch. I think my virtue was I never thought "This is impossible. Humility is the most beautiful virtue that we can develop. When you know how to use it, disobedience can be a virtue. Detachment is a flaw, not a virtue-don't you realize that? A coerced choice does not reflect virtue, only compliance. The greatest offence against virtue is to speak ill of it. Curb your talent lest it speed where virtue does not guide. 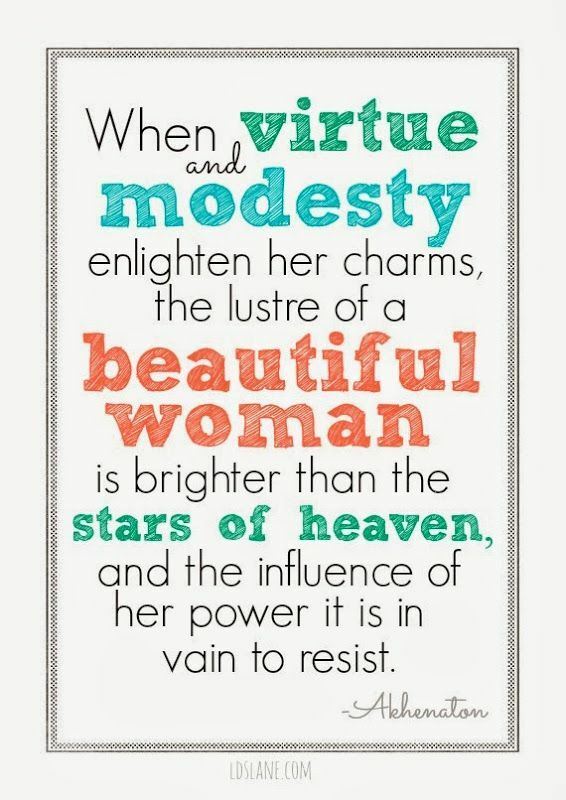 It is not always for virtue's sake that women are virtuous. One can also be undignified and flattering toward a virtue. The most eminent virtue is doing simply what we have to do. Nowhere in the Gospels is intelligence praised as a virtue. When you cannot be just through virtue, be so through pride. Tolerance is the virtue of those who don't believe anything. One path alone leads to a life of peace. 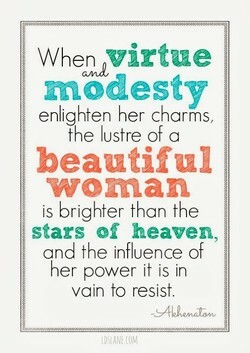 The path of virtue. Truth is not a virtue, but a passion. It is never charitable. It is not becoming to lay to virtue the weariness of old age. Gratitude is a virtue that has commonly profit annexed to it. Pain is God's midwife, that helps some virtue into existence. But everyone's an expert with the virtue of hindsight . . . .
Virtue is the music of the soul, the harmony of the passions. There is no perfecter endowment in man than political virtue. [A] free government . . . cannot be supported without Virtue. What more valuable than Gold? Diamonds. Than Diamonds? 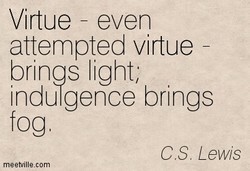 Virtue. Those who make virtue their profession are the ruin of virtue. Nature does not loathe virtue: it is unaware of its existence. I never was so rapid in my virtue but my vice kept up with me. The virtue which we appreciate, we to some extent appropriate. Virtue is a kind of health, beauty and good habit of the soul. Illumination by the Spirit is the endless end of every virtue. Humility, which is a virtue, is always fruitful in good works. Guess what? By virtue of being American, you are not innocent. Acts are right in virtue of the goodness of their consequences. Lofty souls are always inclined to make a virtue of misfortune. There is neither vice nor virtue, there are only circumstances. Pretending is a virtue. If you cant pretend, you can't be king. Style disdains comfort and is always ready to sacrifice virtue. Silence is a virtue in those who are deficient in understanding. What makes Existence really nice Is Virtue--with a dash of Vice. He who possess virtue in abundance may be compared to an infant. In matters of government, justice means force as well as virtue. It is not a sin to be happy, it is not a virtue to be miserable. Virtue is the health, true state, natural complexion of the Soul. To know your faults and be able to change is the greatest virtue. 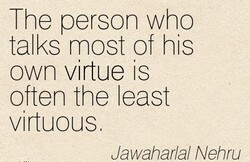 Virtue isn't not wronging others but not wishing to wrong others. If virtue goes to sleep, it will be more vigorous when it awakes. Tolerance is the virtue of people who do not believe in anything. 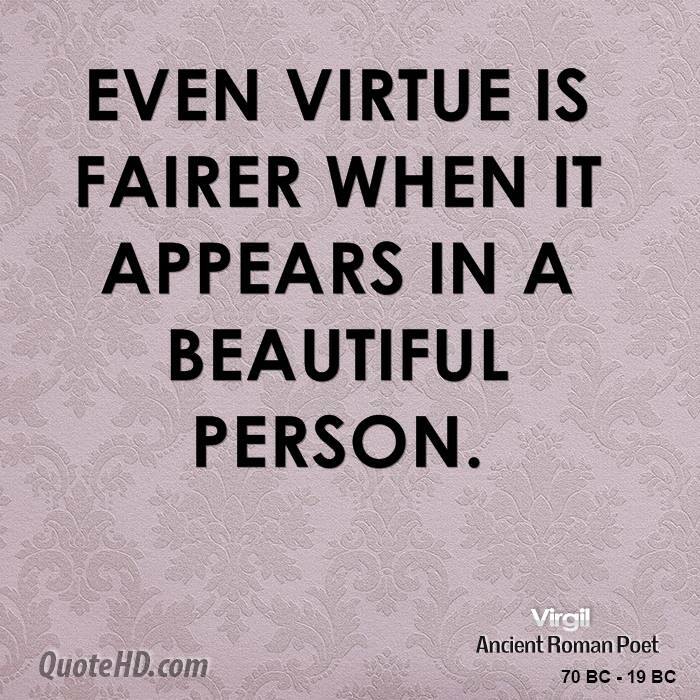 Virtue is not a thing you can have by halves; it is or it is not. Virtue in distress, and vice in triumph make atheists of mankind. 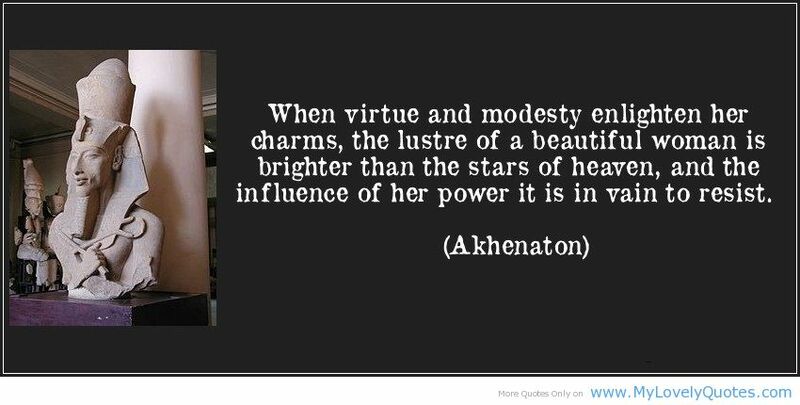 And, is not Virtue in Mankind The Nutriment that feeds the Mind? There isn't any virtue where there has never been any temptation. A lady of honor may be raped once, but it strengthens her virtue. Faith is the foundation of every virtue that strengthens marriage. 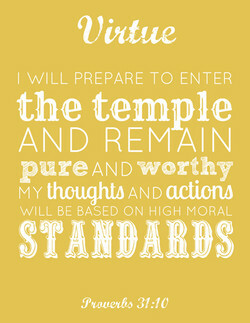 I intend to follow the path of virtue. It will not be overcrowded. Vice is a dreary business. 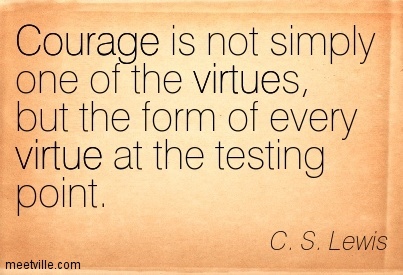 And virtue is not a lot of fun, either. The only rules not meant to be broken are those of love and virtue. To speak of atrocious crimes in mild language is treason to virtue. To live a life of virtue, match up your thoughts, words, and deeds. Humility is the virtue that requires the greatest amount of effort. Half our virtue arises from our being out of the way of temptation. It is virtue that gives glory; that will endenizen a man everywhere. No woman is envious of another's virtue who is conscious of her own. 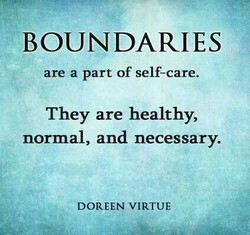 Moderation means prevention. 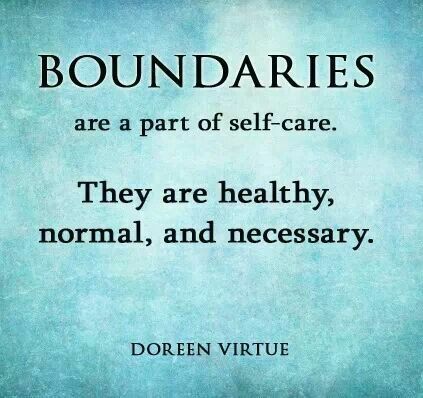 Prevention means achieving much virtue. The virtue of the country is that it makes you thirsty for the city. It is easy to see that when republican virtue fails, slavery ensues. The proof of liberal virtue is generousity with other people's money. History teaches us virtue, but nature never ceases to teachh us vice. Nonviolence is the virtue of the manly. The coward is innocent of it. True happiness lies in the senses, and virtue gratifies none of them. Virtue shuns ease as a companion. It demands a rough and thorny path. 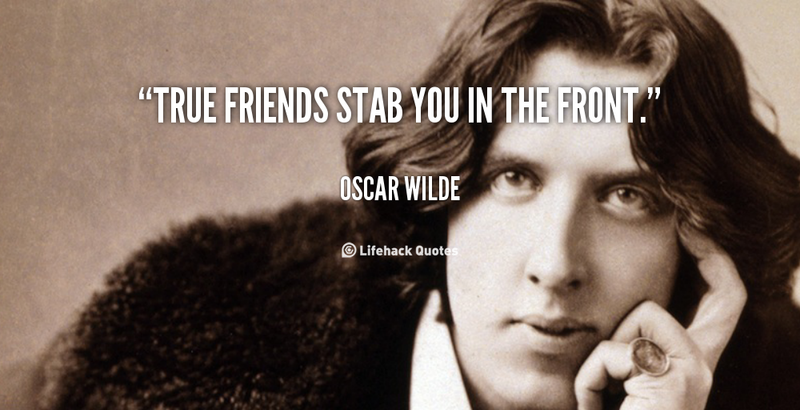 Suspicion is a Virtue, if in the interests of the good of the people. The foundation of domestic happiness is faith in the virtue of woman. 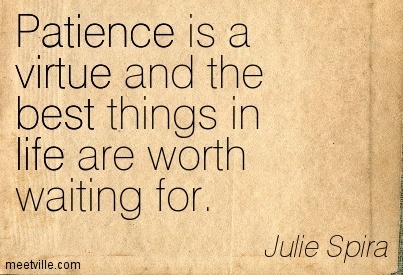 Virtue consisteth of three parts,--temperance, fortitude, and justice. Tolerance is a virtue of people who don't believe in anything anymore. What fervent love of herself would Virtue excite if she could be seen! Purpose is a soft virtue- but it's what gives you steel in your spine. Distress is virtue's opportunity: we only live to teach us how to die. Truth, for its own sake, had never been a virtue with the Roman clergy. Power gradually extirpates for the mind every humane and gentle virtue. We endeavor to make a virtue of the faults we are unwilling to correct. A lesson learned at the muzzle has the virtue of never being forgotten. We cannot well do without our sins; they are the highway of our virtue. Who does not sufficiently hate vice, does not sufficiently love virtue. Big-heartednes s is the most essential virtue on the spiritual journey. Thought must be hidden in the verse like nutritional virtue in a fruit. Gold is a living god and rules in scorn, All earthly things but virtue. Faith is an unclassified cognitive illness disguised as a moral virtue.